May you experience great joy as you enter this exciting challenge! Encourage a friend to take the 30-Day TV-Free Challenge with you. Time is precious, and worth more than money for most of us. How have you been spending your extra time since you’ve accepted the 30-Day TV-Free Challenge? As you’ve probably realized, turning off the TV doesn’t rid your home of idleness; it merely provides time for other distractions. If you want to be more intentional about the way you spend your time, check out Family Fun for Everyone —fifty ideas to help you create new memories with those you love. 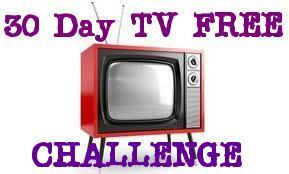 Are you enjoying the 30-Day TV-Free Challenge? It’s exciting to think that others all across the country are not tuning in to the TV, but tuning in to God and their families instead. There are probably many changes in your own home already, and we are eager to hear about them. Are there any evidences of changed hearts? Any new goals and priorities? Has God given you a new vision for what you or your family can accomplish for His kingdom? We encourage you to tell us about your experience . We’d love to hear from you! Congratulations! A month without TV . . . Have you noticed a transformation in your life and home? If so, please tell us about it . We’d love to hear from you. As you reflect on your TV-free month, perhaps you will consider an ongoing changed relationship with your television. If you do choose to resume your TV time, it would be our prayer that this new awareness of God’s presence in your life and home would not be forgotten in the days and months to come. May God bless you, and may you live your life and spend your time for His glory!